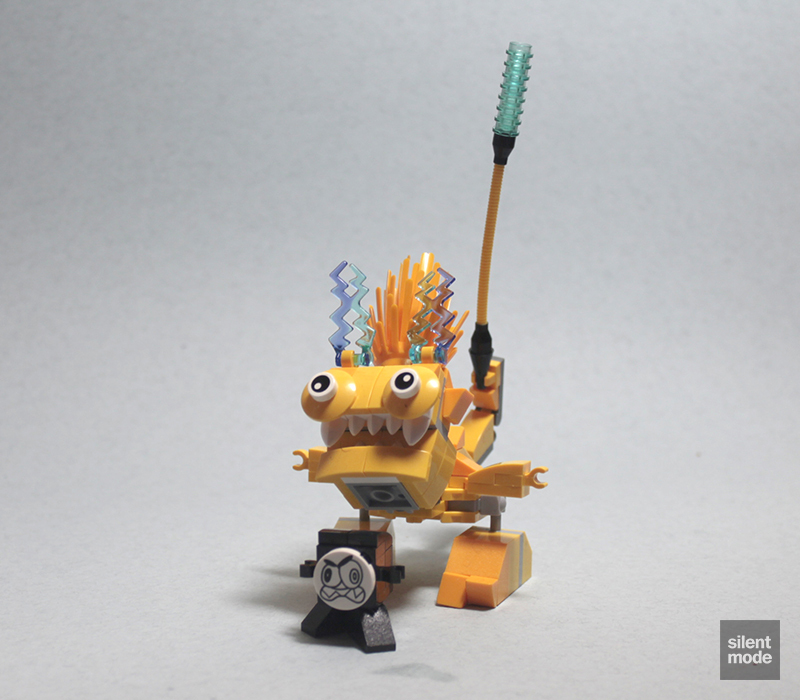 It’s time for the final Series 1 Mixels review, and today we’re going to be looking at Volectro of the Electroids tribe. The fact it has a longer name than Teslo and Zaptor suggests it has greater significance… but let’s dig deeper. As usual, the star of the show appears prominently on the front of the packaging. The drawn character is slightly more interesting in design this time! The immediate star of the show when it comes to parts is the old favourite, the large bush plant, in Bright Light Orange. As you might expect, Volectro currently exclusively possesses the bush in this colour. Did you know it has also appeared in Red and Dark Tan? As has probably been mentioned before, this set also comes with ten cheese slopes in Bright Light Orange, bested only by Zaptor who has 12 of them. However, Volectro has three 2×2 45 degree slopes in Bright Light Orange, and as mentioned elsewhere, eight Yellow “baby bows”. Rather disappointingly it only has two of the new joint parts (parts 15456 and 14704), but to sweeten the deal we’re given three more brand new 1×1 White round tiles with an eye print. Some of you keen-eyed people (bad pun) may have noticed these temporarily appearing in PAB walls, as they’d disappeared quick sharpish! Once again the build process starts off with a solid “core” of parts, incorporating two of the new joint parts. The face is very quickly constructed, with the two White “tooth” plates acting as buck teeth. You’ll also notice a 2L (two stud length) Technic axle being used to prepare for that all-important Bright Light Orange bush. You’ll see how impatient I was to get the photography done for this set! But in all seriousness: all that was left was to build the arms and legs. Rather strangely Volectro has only two fingers on each arm, with each one tipped with a Trans Light Blue 1×1 round plate. It also gets a pair of symmetrical stubby legs. 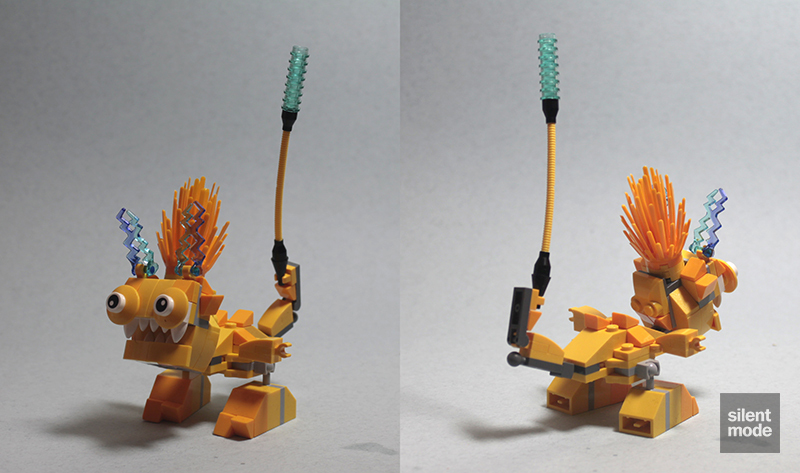 Put everything together and you have Volectro: the touchy-feely member of the Electroids tribe. Call it a kleptomaniac or a little too friendly with children, this is one Mixel you don’t want to get too close to. 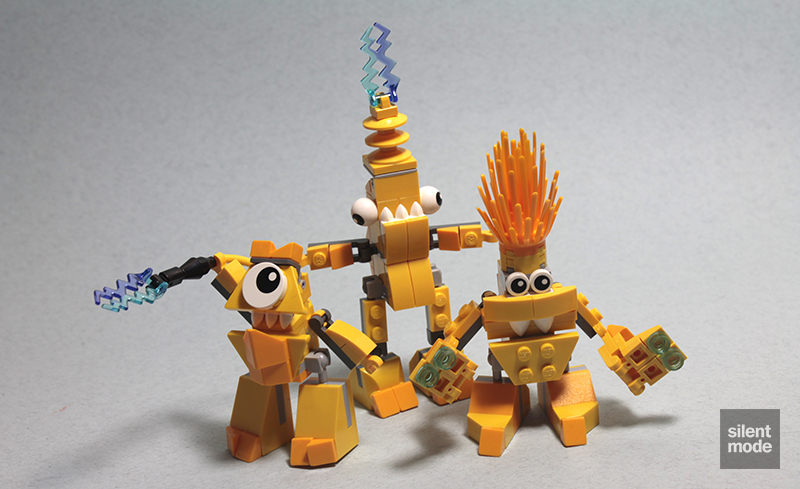 Every day is a bad hair day for scatter-brained VOLECTRO of the Electroids, a zany tribe of Mixels who live high up in the mountainous forest to stay close to the lightning storms that power them. One too many electric shocks have made VOLECTRO emit loads of static energy which this hilarious Mixel uses to draw anything it desires to that mega hairdo! Yes, I’m sure there are some who find Volectro “hilarious”, but I don’t know. As we can see, quite a few leftovers in this set… I double-checked to see if I’d missed the placement of those 1×1 round plates, but it’s legit. We get Electroids Max, which looks like some rendition of a Chinese dog crossed with a scorpion. Teslo’s lethal tail weapon combined with Zaptor’s lightning rod horns and Volectro’s static mane and penchant for getting too close to things make this a serious Mixel to deal with. 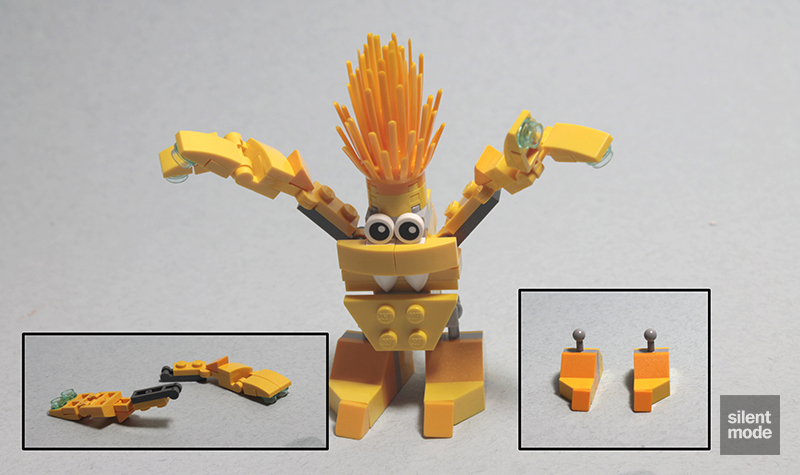 One thing that let this Max Mixel down for me – although I can understand why it wasn’t implemented – is that it’s unable to open and close its mouth, unlike the other two Max Mixels. But what it lacks in bite, it compensates for with the supercharged sting in its tail! As for Volectro: I like the Mixel itself – another one you might find standing on someone’s workplace desk – and appreciate the extra articulation in the long, monkey-like arms. It’s one that might fly off the shelves, solely because of the Bright Light Orange bush. I’m going to give it 6.8/10. 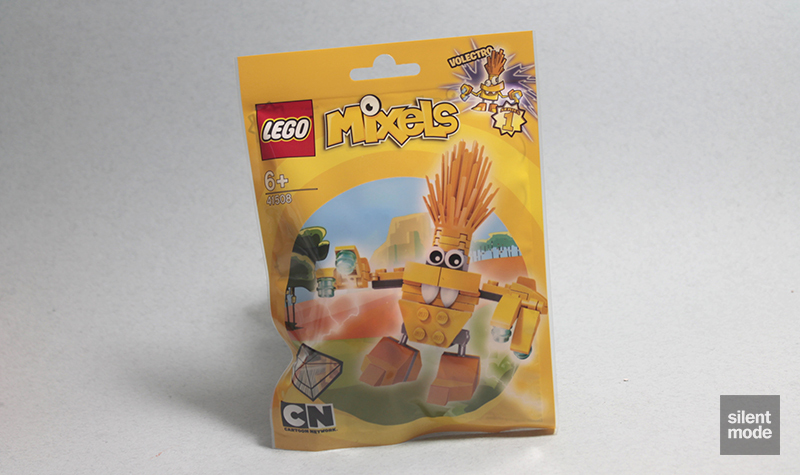 Thank you for bearing with me through these Series 1 Mixels reviews; I hope future reviews won’t take so long to produce.